Barça bounce back from their first defeat for 29 games in the Copa del Rey to secure an excellent 5-0 win in their third away match in a week. This means the blaugranas have opened up an eleven-point lead over Atlético in second place as the team from Madrid were held to a draw against Girona on Saturday. The atmosphere at the cauldron that is Benito Villamarín was electric. The action on the pitch was more muted by comparison with both sides having some decent spells of possession in the opening five minutes. A lovely passing move set Andre Gomes free down the right but his pass was intercepted by a Betis defender. In the 12th minute, Durmisi swung in a cross from the left and Betis legend Joaquin’s half-volley flashed over the bar. Sergi Roberto then turned well with the ball in central midfield but the danger was snuffed out as Joaquin brought him down. Valverde’s team were biding their time against a Betis side who were closing them down well. FC Barcelona had a couple of half-chances in quick succession as Sergi Roberto slalomed through the Betis defence, played a one-two with Suárez, but then sent his effort over the bar. Soon after, Messi found Rakitic, whose shot from 25 yards was Barça’s first effort on target. Sergi Roberto was prominent in the first half and his run led to another chance as he fed Suárez, who played in Messi. The Argentinian hit the side-netting. Unfortunately, Thomas Vermaelen injured himself as he chased down a long ball. The Belgian centre-back had to come off in the 39th minute and he was replaced by the fit again Samuel Umtiti. An enjoyable half of football came to an end with both sides intent on pressing high up the pitch and controlling possession. Barça had slightly more of the ball but neither team had any gilt-edged chances. Sergi Roberto started the second half like he finished the first as he left Durmisi for dead and drew a foul which saw the Betis man go in the book in the 51st minute. Barcelona had a spell of possession around the edge of the opposition’s box as they began to threaten an opener but the space didn’t quite open up and Semedo’s cross was cleared for a corner. Paulinho came on for Andre Gomes. Rakitic broke the deadlock as he made a run from midfield and was found by an inch perfect through ball from Suárez, leaving the midfielder with the time and space to calmly slot the ball under Adan in the 59th minute (1-0). Barça caught Betis napping five minutes later as Busquets dispossessed Fabian. The holding midfielder fed Messi, who was just onside, and the blaugrana star smashed the ball past Adan to put his team in control (2-0). Strike partner Suárez didn’t want to miss out on the action as he scored his side’s third in a ruthless spell (3-0). Barça once again pressed high up and won the ball. This time, Rakitic picked up the ball from Messi and crossed for the Uruguayan to slam home on the volley for his ninth in the last seven appearances. The result was beyond doubt at 3-0 and Leo added some gloss to the score line as Feddal gave the ball away, Suárez passed to Messi, who went past two defenders and rolled the ball into the net (4-0). The effective Busquets was replaced by Deulofeu, who almost added a fifth but was unable to provide the finishing touch from a Sergi Roberto header across the box. Messi was fantastic in the second half and he almost got his hat trick before gloriously dribbling past three players near his own box. The South American duo then combined for the fifth and final goal of the night. 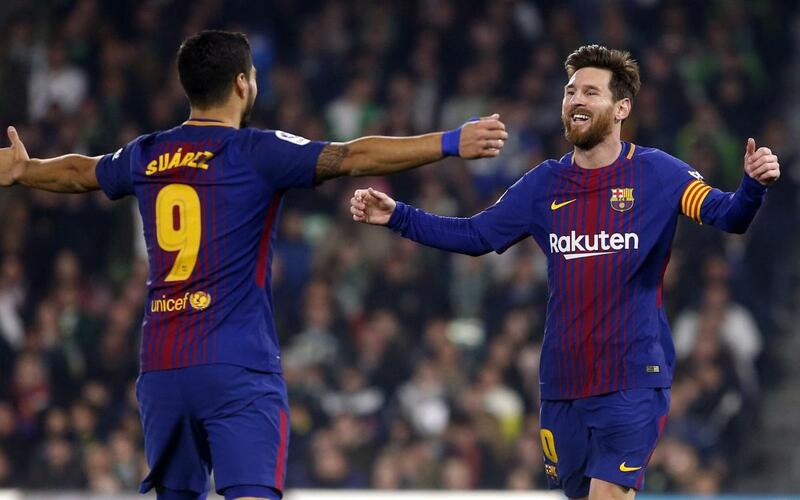 Messi dribbled into the box once again and slipped the ball out to his strike partner, who curled it into the top corner in the 89th minute, making 100 goals in the league for Luis Suárez in a Barça shirt. Valverde’s side showed their class in a majestic second half performance in which they scored five unanswered second half goals to defeat a spirited Betis. The squad will now focus on overturning the first leg deficit in the second leg of the Copa quarters against Espanyol on Thursday.